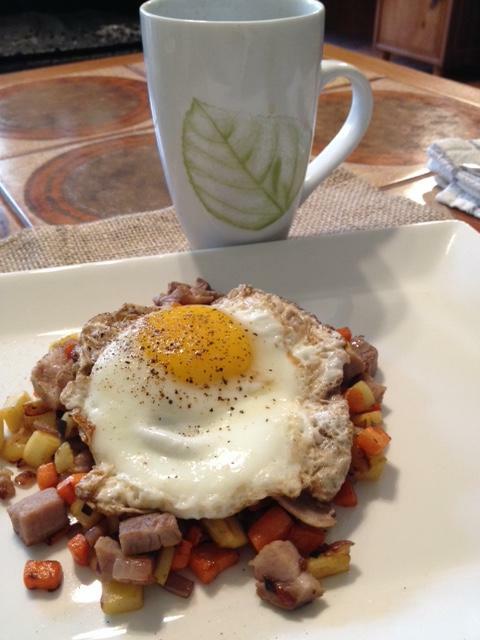 Pork, parsnips and carrot hash with a fried egg. Had an irresistible urge to play with knives this morning and this seemed the safest way to satisfy that urge. My first shot at hash browns. Not bad, but definitely a work in process. Catfish made a brief appearance this morning, just long enough to finish off the last of the cream of the turnip green soup with toast. A bit of catfishing here too. 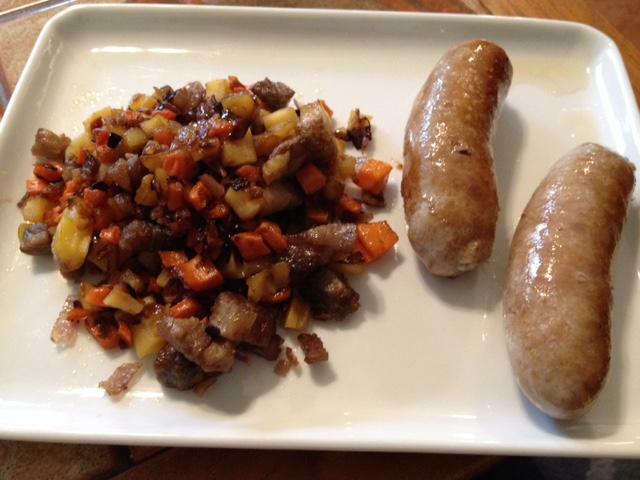 Sausages and leftover hash.
. . . Had an irresistible urge to play with knives this morning and this seemed the safest way to satisfy that urge. We had some nice, black, mushy plantains so . . . my favorite breakfast / dessert: platanos fried in butter and olive oil. Salt and sour cream to go with. Mrs. C's amaryllis in the background. I have neither eaten nor cooked plantains. I must remedy that one of these days. Yours looks very tasty. Thank you, Anna. Plantains are interesting. Hard and starchy when green, still starchy when yellow, but wonderfully sweet when black and soft. 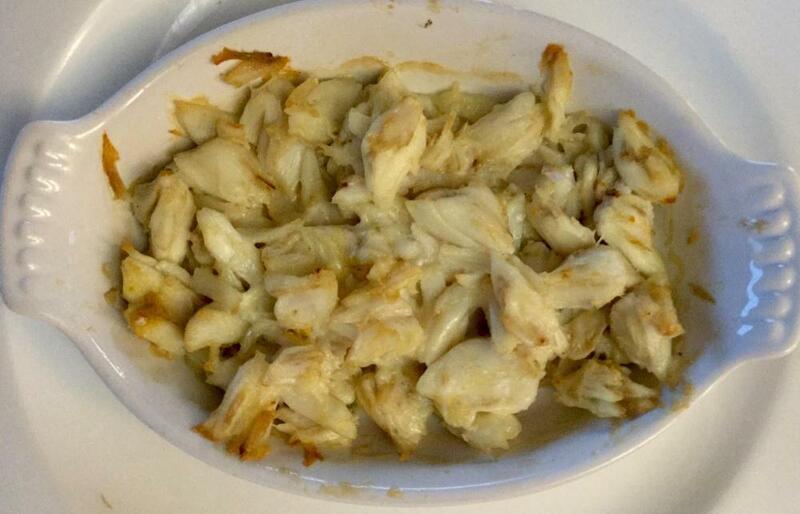 That's how I like them, and you can bring out the sweet by caramelizing them in a hot frying pan. We used to have a local Latino market that would give away over-ripe plantains for free, or at least at a discount. I would have charged more! Over-ripe plantains are also lovely cubed, fried, mixed into pilaf-style rice, and topped with a salty crumbling cheese. I look forward to your plantain remedy! I dearly love ripe plantains; tostones, not so much. When I was in Miami for a conference, I found a little Cuban place about a block from the hotel and ate there three times a day. They knew me after the first day, and knew to bring me maduros, plus whatever else they wanted me to try. It's where I learned to love vaca frita. Yes, I found tostones, as our boys would say, not my favorite. Same goes for mofongo. I kept trying it when we were in Puerto Rico, but apparently I am not a fan of starchy plantains in whatever guise. Vaca frita sounds like rope vieja (in other words, good). One of my sons showed me a picture of a lovely English fry-up. I took it as a challenge to see what I had in the fridge...everything except the blood sausage. 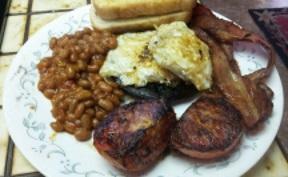 So, for his breakfast, I fried up tomato, Portobello mushrooms, bacon, eggs, and baked beans with toast. He was happy and in food induced comatose for a long afternoon nap. I prefer smth light for breakfast. Usualy I have some breakfast cereal, low-fat yogurt and fruits for breakfast . And a cup of coffee, of course. 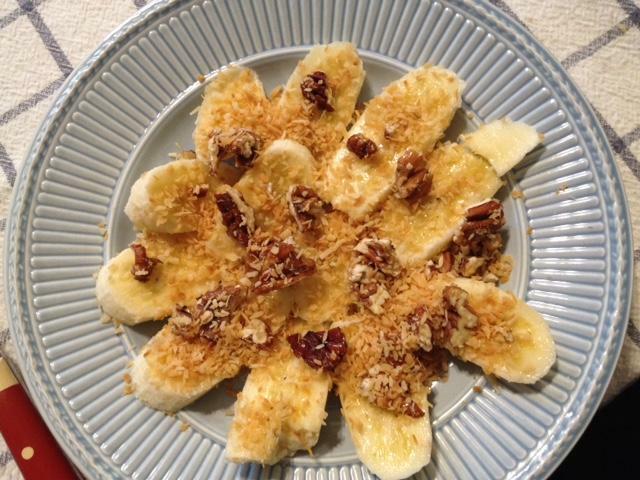 Banana with toasted coconut and candied pecans. No mint sprigs though. Once you can get past the horror of boiling a flank steak, it's marvelous. Made quiche on Friday because daughter was en route to visit for the weekend. We finally got around to it this morning. Ham, fontina, and chives, no crust because daughter has celiac disease. Ham was part of a package from the freezer. I should have pressed some moisture out of it with paper towels. It had a bit too much water in it. Still good quiche, and we'll enjoy it the next couple of days. 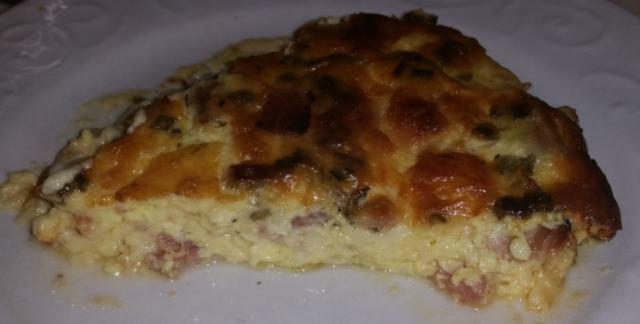 Made one of my all-time favorite beakfasts: huevos al albanil (bricklayer's eggs), a variation on Diana Kennedy's recipe. Soak dried pasilla chiles and blend with onion, garlic, and chipotles in adobo. Fry the sauce and then stir in eggs. 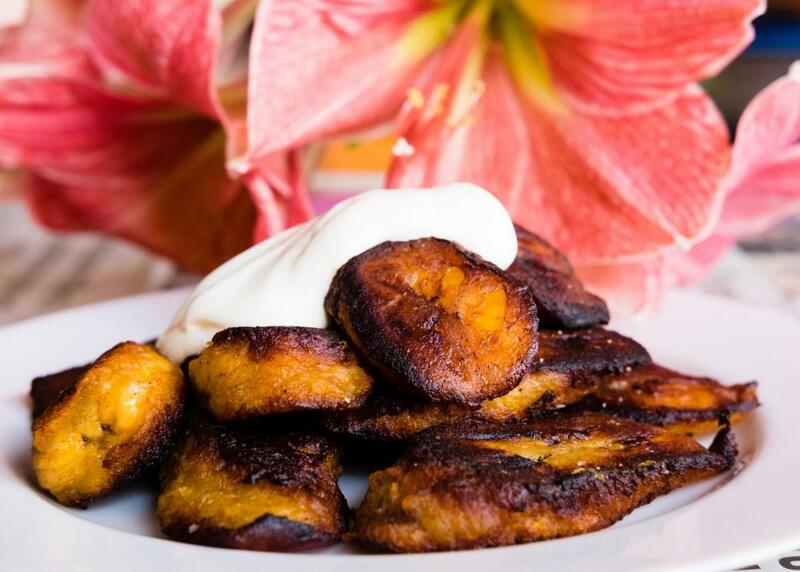 Serve on warm flour tortillas topped with feta cheese, with fried plantains on the side. I spared you all the picture, because it always looks like something that came out the wrong end of a dog with an upset stomach. Much like migas, which always look like something the cat threw up. The huevos al abanil sound good, albeit hotter'n hell. Since I bought crabmeat, it needs to be used up. DH does not like it so I treated myself to ia pound of jumbo lump while he is traveling. 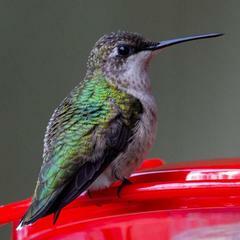 Had it for dinner last night as an appetizer with avocado and mango. This morning simply broiled it in CSO with a little bit of mayo. The breakfast of champions! @robirdstx, great looking biscuits. I would love your breakfast. Yesterday's breakfast was the dinner I didn't cook the night before. 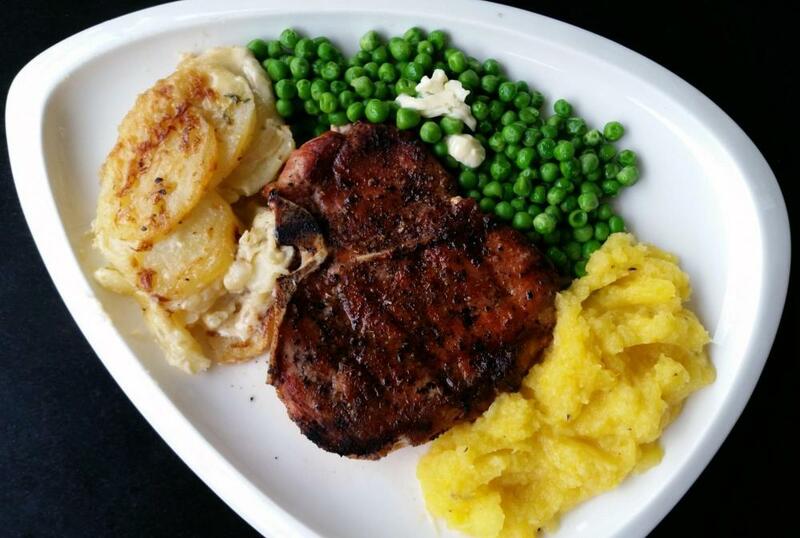 Grilled Pork Chops with potato gratin and mashed buttered acorn squash. If you look carefully just above and slightly to the right of the centre, you will see the tiny red dot indicating its spice level. 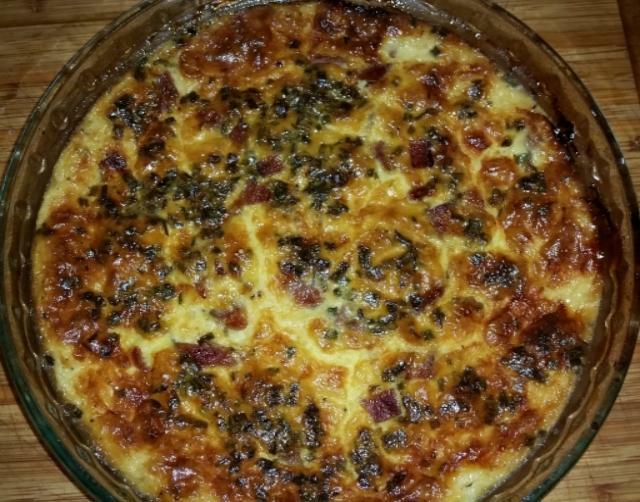 try it w a béchamel that has a little reduced dry white wine in it , perhaps a nice Chabils ? Moe requested something sweet this morning, like cinnamon rolls. 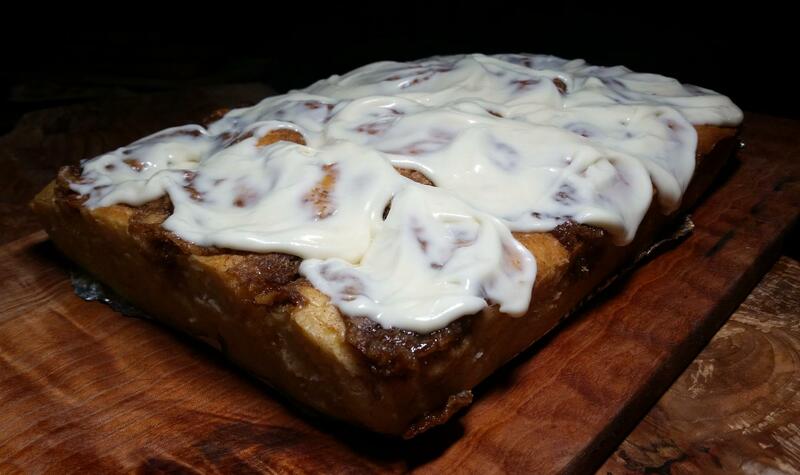 So I baked him a cinnamon roll cake. This is a great breakfast cake because it is easy to make and served warm. 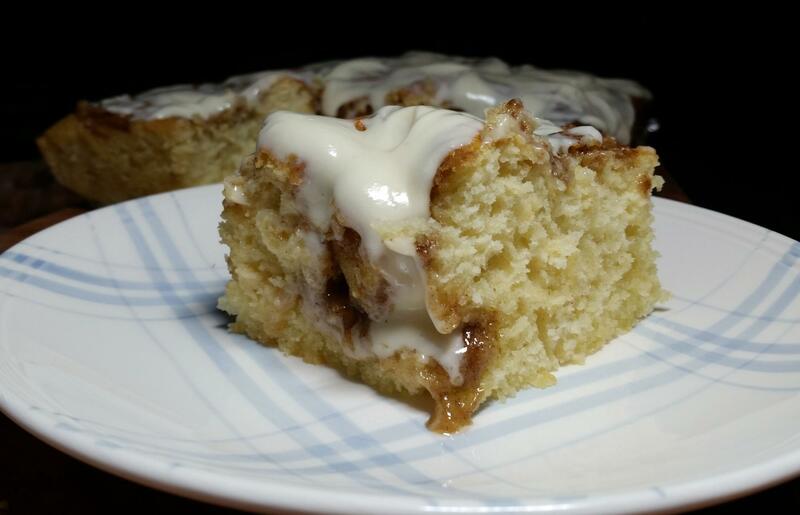 It doesn't have to cool long before topping with the cream cheese frosting. These are something that have intrigued me for years. I have never had one, never heard anyone talk about them, but I see them in the deli counters in a lot of paces. About a week ago I pulled the trigger and bought a box without any idea about which ones are good. Here it is in my freezer door, waiting for me to work up the courage to cook it and give it a try. 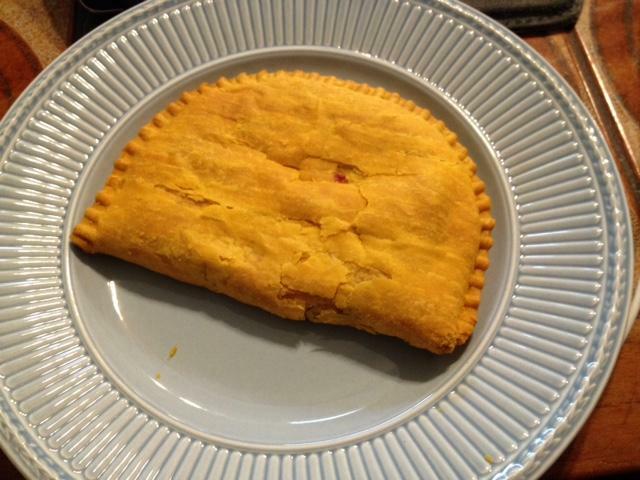 I admit to a secret love for those patties. I buy the mild ones when I can find them. 7-11 often has them already warmed up (blush-blush). Even the mild ones are a little spicy for me - I have to also buy an apple or banana and alternate bites! 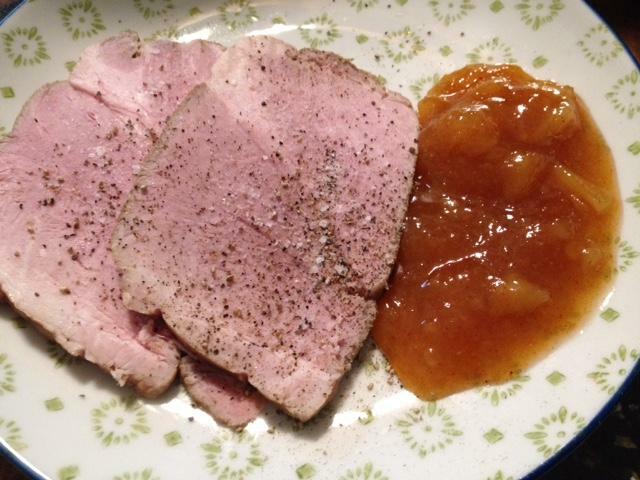 Couple of slices of pork shoulder and some mango chutney. If you can have "all day breakfast" I think we've proved on this forum you can have "all day dinner".